After a quarter century as a hobby potter, I obtained a Diploma in Applied Crafts with Distinction from City of Bath College in 2008 and graduated from Bath Spa University with a B.A. (Hons.) 3D Design: Ceramics, 2:1 in June 2013. I make thrown and slip cast vessels in porcelain and stoneware which are often altered. 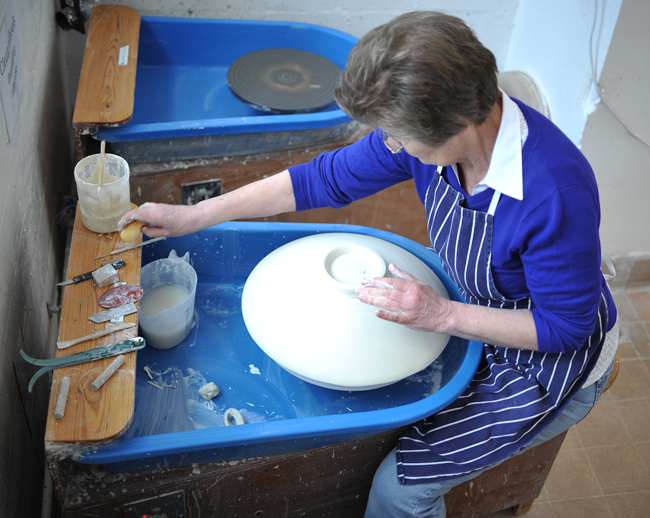 Here you see me throwing a porcelain bowl over a hump of plaster on a potter’s wheel. I am an Associate Member of the Craft Potters Association, a member of the London Potters, an Associate Member of the Somerset Guild of Craftsmen and am a member of the Society of Designer Craftsmen. I aim to show my work in galleries and at fairs.